The most refined vision in dermoscopy. The 4th-generation DermLite dermatoscope has been designed from the ground up to be more refined in every detail. An amazingly smooth, ergonomically optimized all-aluminium design that comfortably moulds to your hand, DermLite DL4 puts phenomenal versatility, the largest optics of any pocket-size DermLite, and instant on/off control right at your fingertips. Large 30mm lens. Brightness Adjustment. Two Colour Spectrums. Built upon the DL3's proven polarized & non-polarized lighting and solid battery life, DL4 now offers two brightness levels, a larger field of view (using a '30mm lens), enhanced imaging of deeper pigmentation with two levels of colour spectrum control (PigmentBoost Plus), and is still more than 25% smaller than the previous generation. Quick workflows. DL4 uses snap connectivity to achieve ground-breaking convenience and fast workflows. 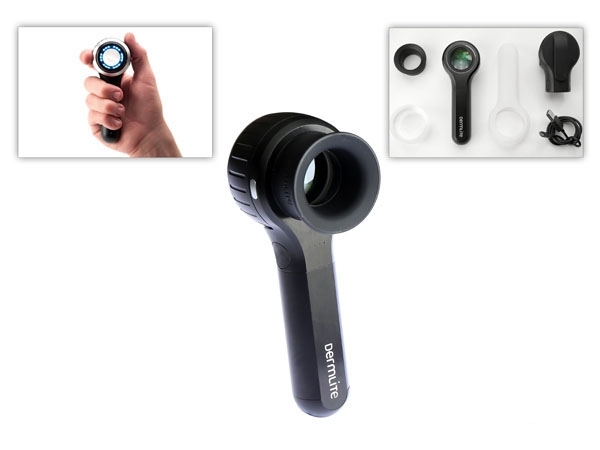 Not only can the glass faceplate (with 10 mm reticle) simply snapped on and off, your mobile devices ' iPad, iPhone or other smartphones ' can attach magnetically, enabling you to go between taking clinical and dermoscopic photos quicker than ever before. Infection Control? You're covered. Along with the growing need for dermoscopy, infection control is becoming an increasingly important aspect of providing care. With its Infection Control and Epidemiology system IceCap', DL4 has you covered. Disposable snap-on IceCaps attach to the spacer and may greatly reduce the risk of cross-contamination. Smooth. Speedy. Precise. A newly developed DL4 retractable glass faceplate design allows you to go between non-contact & contact modalities smoother than ever and lets you precisely focus your image while in skin contact. See deeper. Even into the battery. DermLite DL4's high-powered LEDs and rechargeable battery produce light in an extremely energy-efficient way. And, in order to know when you run out of battery, DL4 now has a more granular four-level charge indicator. If you need to recharge, you can do so from any USB port using the standard Micro USB to USB cable included with each DL4. DermLite DL4 is simply the most capable Dermatoscope available presently due to its 4th generation, advanced technological features. Featuring an incredibly smooth, ergonomically optimised aluminium design that comfortably fits into your hand, this product displays phenomenal versatility. It is equipped with the largest pocket-size optics, DermLite, and an instant switch on/off control right at your fingertips. With DermLites signature magnetic-based design, you can easily attach various eye pieces, contact plates, smartphones and tablet adapters, which will allow your DL4 to double up as a dermoscopic camera.